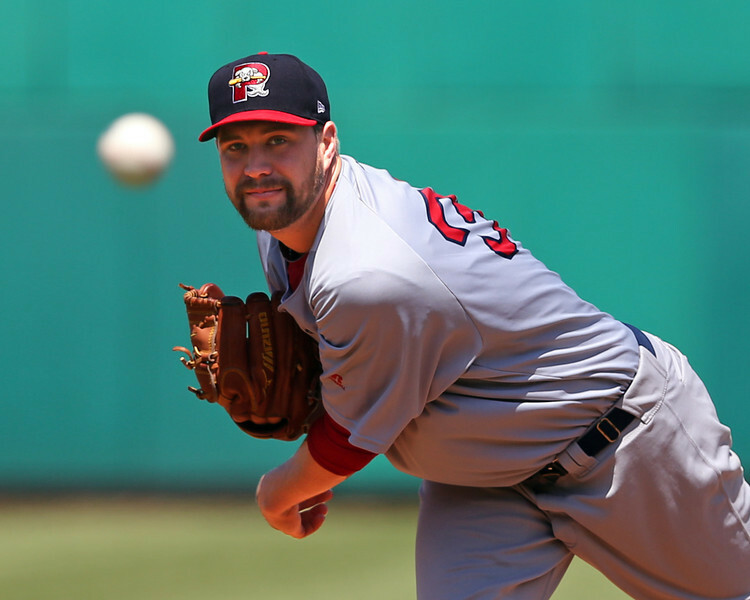 While another left-handed pitching prospect who I wrote about recently has received most of the plaudits in the Red Sox system, Brian Johnson is no slouch and has pushed his way into the upper echelon of pitching prospects in the system. Johnson doesn’t do anything flashy or have a single standout pitch, but what he does bring to the table is consistency across the board, advanced pitchability, and a four-pitch arsenal that will play in a major league rotation. In the recent outing scouted, Johnson showed off these attributes, tossing a seven-inning complete game, while only allowing six hits and one run on a solo home run in the second inning. Johnson also struck out four without a walk, while throwing 72 of his 105 pitches for strikes. Johnson doesn’t have much projection left in his frame, which is not surprising as he was drafted after three years at Florida. He is well-developed, filling out his 6-foot-3 frame, and has a large, sturdy lower half that will lend itself well to withstanding the rigors of a starting pitcher’s workload both within an outing and over the course of a season. Johnson throws from a three-quarters arm slot and his delivery is controlled with workable arm action. He has a compact delivery that he consistently repeats. Extremely quick between pitches, Johnson gets the ball and throws it, with little wasted effort or time, allowing him to get in a rhythm when he is on his game. He does a good job pitching downhill and really understands how to pitch. In the recent outing, Johnson came out with the fastball around 89-91 mph, topping out at 92 mph. However, he ramped up as the outing went on, settling in at 91-93 mph. Once he was ramped up, he held his velocity throughout the outing and consistently threw the pitch for strikes to both sides of the plate. Johnson also showed off a few two-seam fastballs at 87 mph early in counts during the outing. When Johnson finishes the offering, the pitch shows late downward finish in the zone, but flattens out when he leaves it up. Because the pitch lacks plus velocity, Johnson has to be able to locate the offering and when he leaves it up in the zone he gets punished. It showed in this outing when he left an 89-mph fastball up and out over the plate in the second, resulting in a long home run to left field. The pitch grades as average, but can play as solid-average-to-plus due to Johnson’s command profile. Johnson also has strong feel for his secondary offerings, especially his changeup. Johnson threw the changeup at 81-85 mph during the outing, but primarily in the 84-85 mph range. He throws the pitch with good arm speed and it showed late fade in the zone. He recorded one strikeout with the change during this game, on an 84-mph pitch, and it shows the potential to miss bats. Johnson complements his changeup with two breaking balls, a curveball and a slider, with the curveball being the better of the two. Johnson’s curveball worked 75-76 mph in the outing, showing deep 1-7 break. He showed the ability to snap the pitch off with tight rotation and bat-missing ability, especially when he buries it down in the zone. Both Johnson’s changeup and curveball are potential average offerings that again could play up due to Johnson’s overall profile. Johnson also showed a 80-82 mph slider in the outing. The pitch showed short break, but it lacked tilt and was only thrown sparingly, though he did record one strikeout with it against a left-handed hitter. The pitch is a below-average offering currently, but could be effective when used in sequence, especially against left-handed hitters. Though Johnson’s raw stuff doesn’t stand out, he really knows how to pitch and does a good job getting the most out of what he has. What he does have is an advanced four-pitch arsenal that he can mix up and command in order to generate weak contact and get hitters out. Though Johnson will likely never put up stand out strikeout numbers, he should be able to miss enough bats to allow him to project as a potential innings-eating, back-end starter.